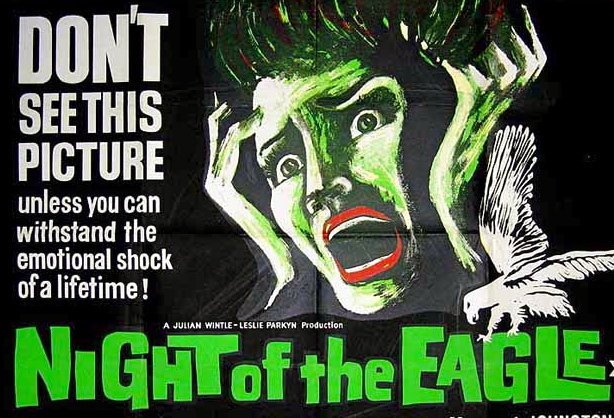 Night of the Eagle is a 1962 British horror film directed by Sidney Hayers. The script by Charles Beaumont, Richard Matheson and George Baxt was based upon the 1943 Fritz Leibernovel Conjure Wife. The film was retitled Burn, Witch, Burn! for the US market (not to be confused with the 1932 novel of the same name by Abraham Merritt). Norman Taylor (Peter Wyngarde), a psychology professor lecturing in belief and superstition, discovers that his wife Tansy (Janet Blair) is practicing witchcraft. She insists that her charms have been responsible for his academic career, despite him being the youngest and newest among his colleagues, and his well being. A firm rationalist and angry at her superstition, Taylor forces her to burn all magical objects in the house. Almost immediately things start to go wrong: A female student accuses him of violation, her boyfriend threatens him, and an unseen menace tries to break into their home. Tansy, willing to sacrifice her life for her husband’s, almost drowns herself and is, as the film suggests, only saved in the last minute by Taylor giving in to the practices he despises. Later, Tansy attacks him with a knife, but he manages to disarm her and lock her in her room. Her limping walk during the attack gives Taylor a hint where to find the person responsible for his ill luck. He identifies university secretary Flora Carr (Margaret Johnston), wife of a colleague whose career stalled in favour of Norman’s, as the perpetrator. Flora has his home, where Tansy is still locked in, go up in flames. Then, with the help of a ritualistic sound recording, she awakens the giant stone eagle which presides on the top of the university building’s entrance to attack Taylor. Flora’s husband arrives at the office and stops the tape machine. The eagle disappears, and Tansy manages to escape her burning home. On her way out of the campus, Flora passes the again immobile stone eagle. The statue topples over and buries Flora under her, killing her in an instant.